I have been at loose ends and trying to find something that peaked my interest. I've always done things with my hands. I've sewn clothes, painted (by numbers), crocheted, did needlepoint etc. I have lovely framed needlework all over the house that I can enjoy whenever I look at them. I've also recently taken up adult coloring which I like to do but was looking for something new. I love peacocks and went online to look for things to make with peacock designs. I found this needlework and sent for it. Much to my dismay the "beads" were so tiny I didn't think that I would be able to do it because of the arthritis in my hand. I contacted the company about returning it and the person I spoke with said "why don't you just try it? You can send it back if you find you can't do it." So three weeks ago I hesitantly picked up my tweezers and very slowly started working with the picture. I really didn't see how I was going to be able to finish the whole thing but I tend to be very determined when I set my mind to something. Little by little I started working faster and the picture really started to take shape. I thought it was going to take me at least a couple of months, but I completed it in less than three weeks. I am attaching a picture which doesn't do it justice because when the light shines on it, it sparkles. I am going to take it to have it framed and I know exactly where I am going to hang it. 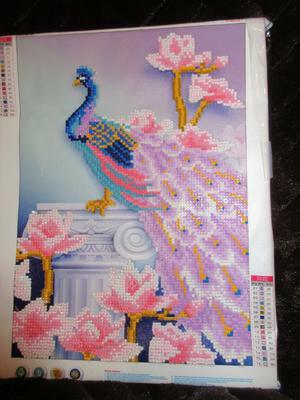 This is a partial which means some of the picture is already "painted" and the rest you adhere the beads. I am going to make a big leap of faith that I can accomplish this, but I just ordered a full bead design. Wish me luck! So my advice to you (and myself) is don't give up at first. Give yourself some time to try and complete whatever it is you are trying to do. Most usually you can accomplish it! Your peacock is gorgeous! Looks like you have found an outlet for your creativity and skill. Stick with it! I know that you are very proud of this. It is beautiful and some of the beauty comes from your determination to finish it. Job well done! Even more so because YOU stuck with it and did it! Thrilled to read your story! Kudos to you!